If you’re tired of dragging out your lawn mower to spend your Saturday morning sweating over your lawn, it might be time to try foodscaping. Instead of a yard full of grass, foodscaping is a landscaping technique that covers all usable space with a beautiful arrangement of plants that can actually be eaten. Basically, it’s a hybrid between landscaping and farming and it takes gardening to a whole new level. Fruits and vegetables can add color, texture and visual interest to your yard, while providing fresh tastes for your family to try. Still not convinced? Consider what else foodscapes can do for you. 1. There will be fresh produce right outside your door. When your lawn is covered in edible plants, all you have to do is walk outside to get the ingredients for a flavorful and nutritious meal. You no longer have to make a trip to the grocery store or settle for sub-par produce. You’ll have pesticide-free, organic produce at your fingertips every day. 2. You can have a smaller carbon footprint. In addition to the health benefits of home-grown food, you’ll also limit your carbon footprint. With produce conveniently available at your door, you’ll spend less time in the car traveling to and from the store. You’ll also avoid the carbon emissions associated with shipping produce across the country to keep the supermarket stocked. Most of the fruits and veggies at the grocery store travel hundreds of miles in inefficient refrigerated trucks that are environmentally taxing. Foodscaping your lawn isn’t any more expensive than landscaping it with trees, shrubs and sod. But over time, the edible goods you plant can pay for themselves. The fresh fruits and vegetables harvested from your yard year after year can save you a bundle on groceries. Some people claim to save more than $1,000 a year by dedicating some yard space to food. 4. You could save time in the yard. 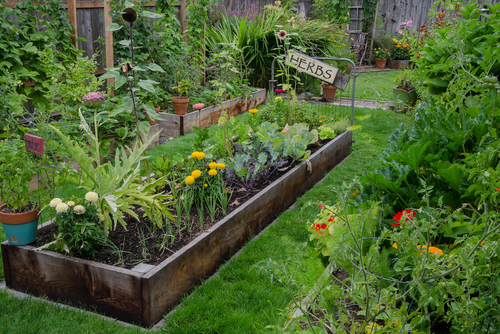 It may seem like an edible yard is a huge time commitment, but it doesn’t have to be. If you choose hearty plants that are native to your area, they will grow easily with little effort on your part. • In hot climates, such as Texas, look for plants that require little water. Beans, spinach, tomatoes, cabbage and broccoli do well in drought-like conditions. • In humid conditions, such as those found in Florida or Hawaii, try your hand at tropical fruits such as pineapple, bananas and mangos. • For colder climates without frost plant blueberries, strawberries, melons and rhubarb that will add color to your yard. Plenty of tree varieties do well in this type of climate as well, so you can enjoy fresh cherries, plums, olives and almonds. • In the extreme cold, you’ll want to grow hardy plants that can withstand the cold. Broccoli, cabbage, carrots, peas, radishes and chard do well in cold climates. There are also many berries, nuts and fruits that can survive the bitter cold.